In Poland I discovered the work of two artists; Karol Frycz (1877-1963) painter, stage designer, theatre director and Stanisław Wyspianski (1869-1907) playwright, painter, poet. They both also worked extensively in stained glass and church decoration. This work was new to me as there were no illustrations of their windows in the stained glass books I pored over when I was studying (pre internet era), although this is true of many figurative stained glass artists from that period. I have now seen several examples of their work in different settings, but here I have chosen one church decorated by each artist to show how good new glass can look in an old church. St. Jacobus, Sandomierz, chancel windows by Frycz, made in Krakow by the firm of Gabriel Zelenski in 1914. In Sandomierz, we found the Dominican Church of St. Jacobus by chance. It's one of the oldest brick churches in Poland, completed around 1211, and its beautifully shaped windows are filled with the magical stained glass of Karol Frycz. The side chapel in the church was closed, but offered tantalising glimpse of Frycz's wall paintings through the grille. Views towards the west wall inside St. Jacobus with four figure windows and gorgeous white canopy shapes above. How well this type of stained glass - small pieces of every colour - goes with the brick work. I particularly admired the four women, Adelaide, Kinga, Salomea, Jolanta, high up on the west wall. The figures themselves, including their clothes and objects, are what make up the decorative pattern and rhythm of the compositions, so much more powerful than those windows where the most interesting parts are the decorative backgrounds and borders to a wishy washy figure. The Basilica of St. Francis of Assisi, Krakow, looking west and up. The Basilica of St. Francis in Krakow is totally filled with pattern and colour, the walls and almost every window were designed by the great Stanisław Wyspianski. It is an amazing example of clashing patterns and subject matter, with decoration and architecture from different periods coming together to create a thrilling, strange interior. The west window, seen in context above, is completely filled with the figure of God bringing the world out of chaos. No borders, hardly any glass painting, instead ribbons of colour. The hand detail may help you imagine the monumentality of scale, even the pieces of brown glass that make up the veins in God's right hand are quite big (below right). West window, 1901 (astonishingly) and detail of God's right hand. Windows to the left of the high altar, showing poppies, lilies and St. Clare. The clerestory windows contain a series of quite realistic but equally huge wildflowers, a theme that is continued in the six windows around the apse and high altar. Sometimes, depending on the time of day, you can see how beautifully these windows mingle with the rich wall paintings beside them. I loved the poppy window and the one with the subtle figure of St. Clare (both shown above). Again they are made of huge pieces of sinuous pale coloured glass with very little painting. In the wall decoration (just visible in the photo above left, detail below right) realistic flowers flow across a geometric background, a classic combination of wall decoration where the rectilinear background shapes anchor the flowing plants as the glazing bars do on the massive panes of stained glass. Windows to the right of the high altar, and section of wall decoration from the same area. "I’ve got a dread of modern stained glass. It is often painful to look at the windows of old cathedrals and churches. Above your head soars a vaulted roof, supported by massive columns and gothic arches. Tombs and epitaphs tell of bearded Tudor merchants, Jane Austen-era gentlefolk, Victorian bishops. The past has been bottled. Then you catch sight of a bright, abstract 1970s window, and it is blindingly out of place. The past is shattered like a glass hurled at a pub wall." "When I complain about “modern” stained glass, what dates are we talking? 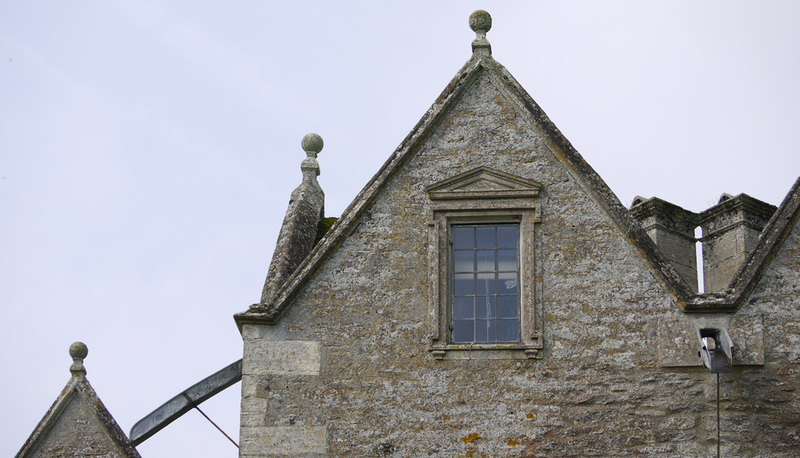 It’s possible that I mean any coloured window made later than 1642. Almost all Victorian stained glass is terrible: dull in colour, mawkish in mood, grey and melancholy in effect. It is easy to see why, confronted with so many Victorian windows filling parish churches with mediocrity, modern artists decided they could do better."